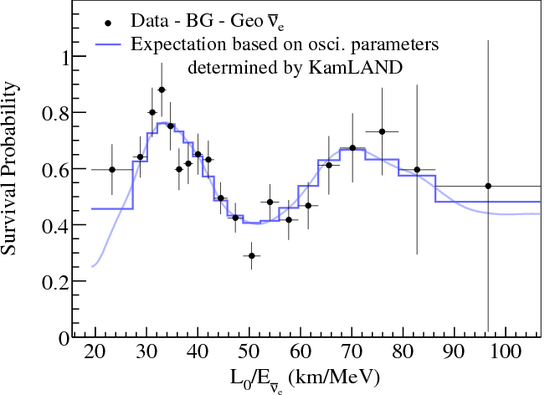 Allowed region for neutrino oscillation parameters from KamLAND and solar neutrino experiments. 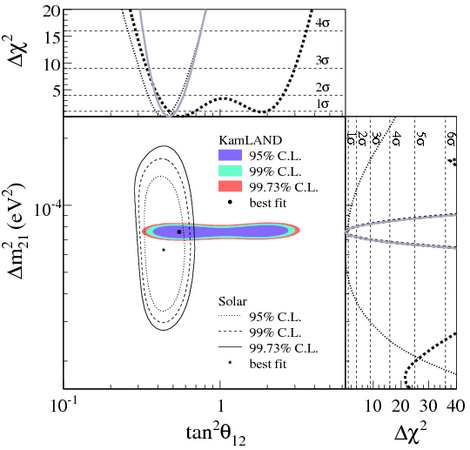 The side-panels show the Δχ2-profiles for KamLAND (dashed) and solar experiments (dotted) individually, as well as the combination of the two (solid). The KamLAND data severely restrict Δm2 to one region, with the best-fit point at Δm2=7.58+0.14-0.13(stat)+0.15-0.15(syst)x 10-5eV2. Ratio of the background and geo-neutrino subtracted anti-neutrino spectrum to the expectation for no-oscillation as a function of L/E. L is the effective baseline taken as a flux-weighted average (L=180km). The histogram and curve show the expectation accounting for the distances to the individual reactors, time-dependent flux variations and efficiencies. The figure shows the behavior expected from neutrino oscillation, where the electron anti-neutrino survival probability is: Pee=1-sin22θsin2(Δm2L/E). Published in Phys. Rev. Lett. 100, 221803 (2008) arXiv:0801.4589 [hep-ex]. The KamLAND experiment has determined a precise value for the neutrino oscillation parameter Δm221 and stringent constraints on θ12. The exposure to nuclear reactor anti-neutrinos is increased almost fourfold over previous results to 2.44x1032 proton-yr due to longer livetime and an enlarged fiducial volume. An undistorted reactor anti-neutrino energy spectrum is now rejected at >5σ. Extending the analysis down to the inverse beta decay energy threshold, and incorporating geo-neutrinos, gives a best-fit at Δm221= 7.58+0.14-0.13(stat)+0.15-0.15(syst)x10-5eV2 and tan2 θ12=0.56+0.100.07(stat)+0.10-0.06(syst). Local Δ χ2-minima at higher and lower Δm221 are disfavored at >4σ. Combining with solar neutrino data, we obtain Δm221= 7.59+0.21-0.21x10-5 eV2 and tan2 θ12=0.47+0.06-0.05. KamLAND stands for "Kamioka Liquid Scintillator Anti-Neutrino Detector". With 1000 tons of light emitting liquid target viewed by 1879 50-cm diameter light-detecting photomultiplier tubes, KamLAND is the largest scintillation detector ever constructed (brief description).